These cookies will completely knock your socks off! 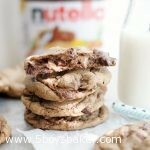 They are chocolaty, toffee, Nutella goodness! In bowl of an electric mixer, beat butter and sugars together until creamy. Add egg and vanilla and mix until light and fluffy (about 2 minutes). Add Nutella and mix well. Add flour, salt and baking soda and mix until combined. Stir in chocolate chips and Skor bar. Chill dough for 30 minutes (not necessary, but I like how the cookies bake up if the dough has been chilled slightly). Scoop two small balls of cookie dough (about 1 1/2 Tbsp) and place a dollop of Nutella on top of one of the balls of dough. Place the second ball of dough on top of the Nutella and gently press the the edges together to make one large dough ball. Place on lined cookie sheet at bake at 350 degrees for 12-14 minutes. Let cool on cookie sheet for about 3-4 minutes then move to a cooling rack.